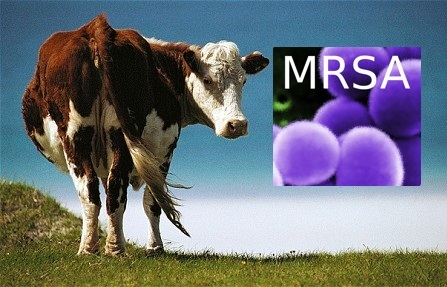 KSRealityBites: MRSA strain found in UK Cows! MRSA strain found in UK Cows! A group of British & Danish scientists identified a new strain of methicillin-resistant Staphylococcus aureus (MRSA), the powerful bacteria that has been responsible for more deaths in the U.S. than HIV/AIDS. The study published in the June 3 edition of the British medical journal "The Lancet Infectious Diseases". The new strain of the well-known antibiotic resistant superbug has been discovered in cow's milk in the UK. Despite being quite common in Indian hospitals, the new strain's genetic makeup is different enough from previous MRSA strains & cannot be detected by traditional genetic screening methods. Dr. Mark Holmes, author of the Lancet paper, told reporters at a press conference that, “The molecular tests most often used to confirm MRSA status will be falsely negative if we don't take into account the new strain. Some MRSA that may be out there may not 've been detected. "MRSA is a drug-resistant form of a usually harmless bacterium which can be deadly when it infects wounds. The 35 or so strains of antibiotic-resistant superbugs are genetically fairly similar. However, this new variety is very different & it is thought that it might 've first emerged from cows. Antibiotics are widely used by dairy farmers to treat cows with mastitis (Inflammation of a breast). However over-use means some bacteria become resistant & difficult to treat if humans become infected. "If you drive your cows harder to produce more milk you get more mastitis," Dr Holmes added at the conference. The authors, however, made it clear that pasteurization of milk will prevent any risk of infection via the food chain but individuals in close contact with cattle could be at higher risk of carriage. "Further research is needed to test this hypothesis," they added.